The Reading's fleet of electric MU coaches began delivery in 1931 by Bethlehem Steel Co. for use in Philadelphia area suburban service. 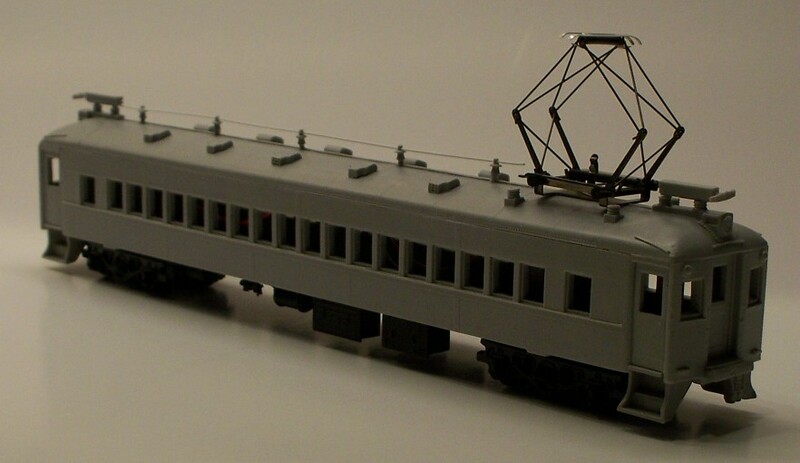 The coaches were 73' long (63' passenger compartments) and were delivered with roof buss bars that could allow a train to share overhead power with only a few pantographs raised, saving wear on both pans and catenary. Coaches and combines were the most prevalent types. Most had Taylor trucks, some later cars had Commonwealth trucks. In the 1960s, several dozen cars were rebuilt. They were given air conditioning, new seats and a new blue and white paint scheme, giving them the nickname 'Blueliners'. Many survived into SEPTA service, operating in rush-hour express service, and were finally retired in 1990. IHP now brings these cars to HO for the first time in plastic, with detailed ready to run models of the coaches as built. Kits have one-piece plastic bodies and plastic frames with cast-on underbody detail and interiors. Add-on details include roof buss bars and cables, working pantographs, horns, safety chains on the end doors, clear flush-fitting window inserts, and Taylor trucks. The prototypes had 8'9" wheelbase motor trucks at one end and 8' wheelbase trailing trucks at the other, our models have the same feature. 36" wheels are also included. A set of gold letter decals for Reading MU cars is also included. Can be powered with a power truck such as the NWSL Stanton Drive. Nonpowered kits will be produced only in a limited quantity, so order when available!